The ONLY valve with a permanent type, patented gasket application. Rated for continuous operating currents up to 10 amps @ 250VAC (15 amps @ 120VAC, 5 amps @ 24VDC), is the industry standard for over-temperature protection. Silicone tubing for use in many HVAC applications. Round 1/4" valve flare cap with seal. The SRL series of 1/2" bimetal temperature controls offers proven reliability in a compact, versatile, cost-effective design. The SHL series of 1/2" bimetal temperature controls offers proven reliability in a compact, versatile, cost-effective design. A complete line of control transformers designed for HVAC/R applications. Primary Voltage: 120V. Secondary Voltage: 24V. Adjustable air pressure sensing switch kits ideal for residential and light commercial furnace, electric air cleaner and humidifier applications. 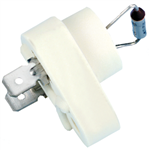 Universal small footprint air pressure sensing switch that replaces hundreds of small footprint air switches. Straightens and separates bent fins quickly and easily. One tool can be used for up to 3 sizes (11,12, and 13 fins per inch) of fins. 110 to 125VAC Solid-state Hardstart Relay, includes relay, overload, and start capacitor.